Despite Easter Sunday looming, the UK still remains in deepest winter with Arctic winds dropping the chill factor below freezing. Fortunately with 13-17 knots of shifting easterly breeze blowing this Good Friday there was plenty of action to keep the crews busy in the two opening races of the RORC Easter Challenge, held in the central Solent off Hill Head. The UK season opener for the Royal Ocean Racing Club traditionally doubles as a training regatta in preparation for the season ahead. As ever guru Jim Saltonstall is running the coaching with his team including ex-Olympic Soling sailor Barry Dunning and RORC CEO Eddie Warden Owen. For the RORC Easter Challenge, the outside assistance rule is waived allowing Saltonstall and his team to provide coaching mid-race, while as ever his post-race debriefs, with accompanying video showing the highlights and horrors of the day, are standing room only affairs. After today's races RORC Easter Challenge regular Simon Henning and his Farr 45, Alice II, are the runaway leaders in IRC One, winning today's second race and third in the first. This year Alice II is in good company with two other Farr 45s to race, plus a trio of Ker 40s. On the water it has been the 52 footers leading the charge around the race course. The RORC Easter Challenge is the first competitive outing for 5°West, the former TeamOrigin TP52, helmed by Sir Keith Mills and featuring a studded crew led by Volvo Ocean Race sailor Robert Greenhalgh and with Laser Olympic gold medallist Paul Goodison calling tactics. Mills spearheaded the London bid to host last year's Olympic Games. "Now the Olympics are over I have a bit more time and I thought I'd give the TP52 a go this season. It's nice to get back on the water," he said. 5°West currently lies in fourth place in IRC One after a disappointing opening race when they missed a wind shift. "It was a good warm-up day for us," said Mills, who admits he is on a steep learning curve helming. "Now we just have to get the crew topped up with anti-freeze for tomorrow and we'll be in good shape." Having a tougher time today was the Farr 52 Toe in the Water, skippered by Lloyd Hamilton and with the fastest man non-stop around the world, Brian Thompson, calling tactics. The Toe in the Water crew is mostly from the forces, and includes two injured servicemen and one woman from the Defence Medical Rehabilitation Unit at Headley Court. "Today was good," commented Thompson. "We had two practice starts which both went well. Then the first proper start was great except we touched the pin with our guard rail so we had to turn around and we were playing catch up from there." They redeemed themselves in the second race when Toe in the Water was nipping at the faster 5°West's heels. "At the last windward mark we were crossing tacks with them. So that was great progress from only having sailed together for the first time yesterday," concluded Thompson. IRC Two is being led by South African Mike Bartholomew's King 40 Tokoloshe, which won today's second race. However the first was claimed by another Mills design, Zero II. Previously campaigned as marinerscove.ie and in last year's Brewin Dolphin Commodores' Cup as Dignity, this 39 footer is now owned by the Cowes Race School and skippered by James Gair. Zero II's crew, experienced racers who are paying their way, was competing together for the first time today, so winning race one was a welcome result. "I love the format because you get the practice starts, it gets the team communication going - it is a great way to start the regatta," said Gair, adding that today's races were challenging - aside from the bitter cold, there was a spring tide running. Sadly Zero II was unable to follow up their success suffering "a multitude of breakages" in race two. This included breaking a jib sheet and having to unwind "the biggest kite twist you've ever seen, which took half the run to sort out," as Gair described it. David Franks and his JPK 1010 Strait Dealer are lining up to repeat last year's record of straight bullets at the RORC Easter Challenge. They won both today's races and lead IRC Three from Peter Morton's Corby 33 Salvo and the Irish J/35 Bengal Magic, skippered by James Chalmers. The HOD 35 Malice lies fifth. "We had a couple of third rate starts but the standard of racing is very good," said skipper Mike Moxley. "Strait Dealer and Salvo are sailing extremely well, so no complaints at all." Moxley hopes that the wind gets lighter as it is forecast to tomorrow, as this will suit them better. Another lower rated HOD 35 is leading IRC Four in Peter Schofield's Zarafa. Like Strait Dealer she also notched up two race wins today to lead IRC Four from Neil Cash and Nick Haigh's First 34.7, Altura & Steamy. 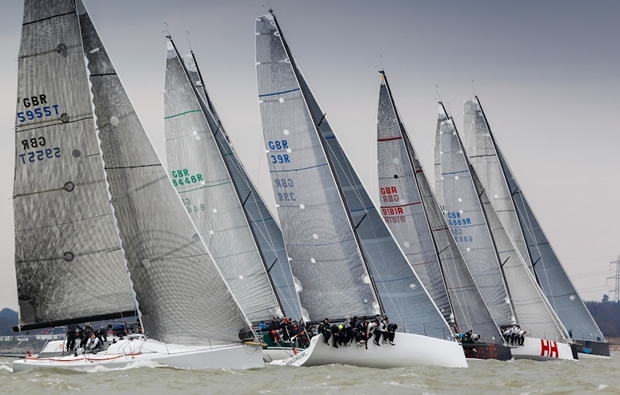 They may be among the smallest boats competing in this year's RORC Easter Challenge but one of the best competitions is occurring between the trio of Quarter Tonners. Here Sam Laidlaw on Aguila is lying fifth, three points ahead of Cote, skippered by his former Farr 52 co-owner Rob Gray. "It was great fun," said Gray of today's racing. "Once you got going you forgot about the cold and it was nicely arranged and everyone had a lot of fun. There was a huge amount of tide running and it was a bit of an each way thing whether to say inshore or stay out and play the shifts. I think both worked at different times of the day. But thanks to everybody who put it on - I'm glad there are so many yachts have turned out." Another bracing day of racing is scheduled to begin tomorrow at 1000.